Weekend Kits Blog: Easy Sewing Project Kits for Beginners! Easy Sewing Project Kits for Beginners! Stash Sax Sewing Kits are available now. 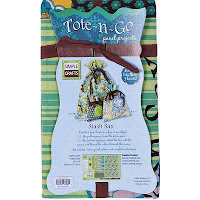 Sew 3 fun bags in just a few easy steps with Tote-n-Go Fabric Panel Projects from Fabric Editions. They're easy sewing projects, perfect for beginners looking for a simple starter project. You'll find them in the Sewing Project Kits section of the store! Stash Sax panel projects include a 36" x 54" cotton fabric panel, ribbon, and complete instructions. The pattern pieces are printed directly on the fabric panel, so it's super easy to cut them out and start sewing! One of the first steps will be to sew on the optional applique. Then, you'll stitch the bag and add the casing, following the easy step-by-step instructions printed on the panel. To complete this easy sew project, simply thread the ribbon through the casing, cinch-up to close, and tie with a decorative bow. You'll need basic sewing supplies on hand to complete your sewing project, including a sewing machine, iron, scissors, thread, and general sewing notions. If you're new to sewing, make sure to visit the Sewing Supplies section of the store for beginner sewing kits and notions. Kit makes 3 bags with ribbon drawstring closures. Finished bag sizes are 14" x 18", 9" x 11", and 6-1/2" x 8". 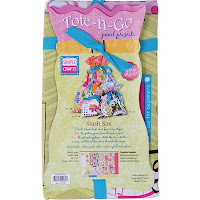 Perfect for holding a variety of personal & household items, including makeup, jewelry, craft projects, and more. Visit the Sewing Project Kits section to see our complete selection of easy sew kits for beginners and experienced sewing crafters. Fabric panel projects are a quick & easy sewing project for crafters to sew 3 drawstring bags in less than 3 hours. Ideal for handmade gift giving! You'll find a completely unique collection of sewing craft kits at Weekend Kits. Stop by today and be ready to sew something new on your next Weekend at Home! New Punch Needle Kits - Easy for Beginners!